Why are we called Forest Saver? 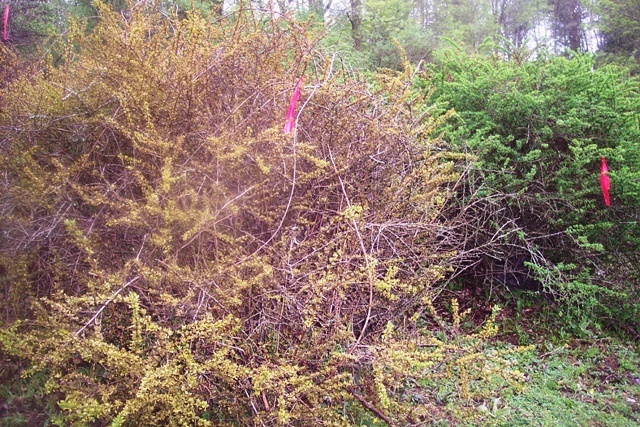 Flame treatment of invasive plants is only done when conditions are too damp to ignite surroundings. Knock back invasives where conditions are too rough, steep or wet for uprooting or shredding and quickly kill back new sprouts. 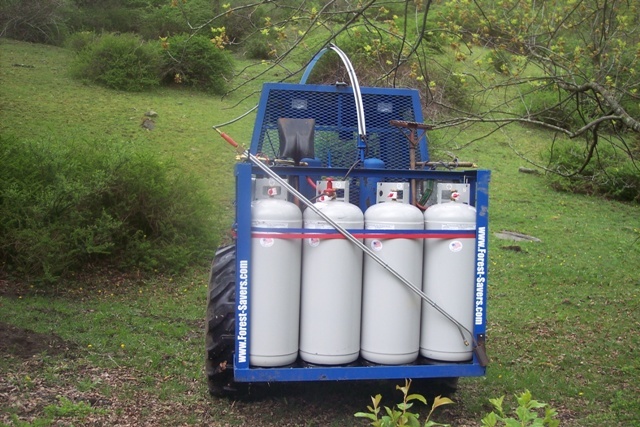 Avoid the use of herbicides that can damage desirable vegetation, and pollute the environment. Forest Savers' 2 million BTU flame treatment system headed onto a site. Since this photo was taken in mid May 2013, the system has been upgraded to a twin torch, 4 million BTU/hour system. reach deep into impenetrable clumps and thickets. Foliar flamed barberry in foreground with an untreated barberry in the background. for 20-30 seconds each then quickly flaming the foliage with high intensity flame. while untreated invasives are green. One month after flame treatment. 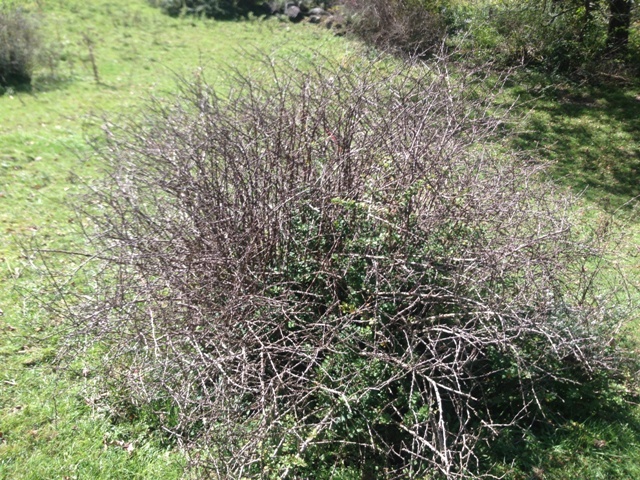 Barberry 4 months after flame treatment. Resprouting can be seen in the center of the clump. thus opening up grazing access to the grass close to clump. Multiflora rose 4 months after flame treatment. 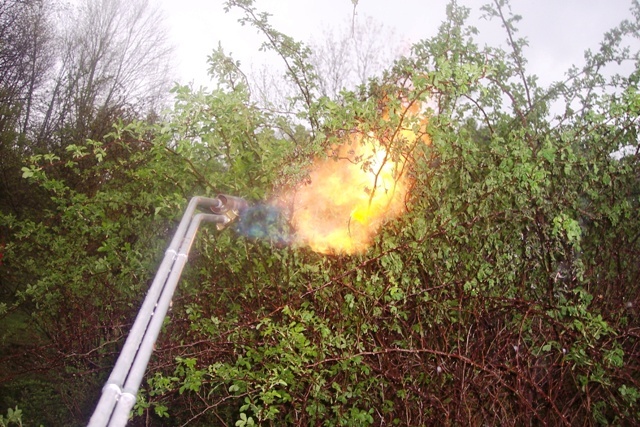 How successful have you been using flame to control knotweed? How many follow-up treatments? Would this site have been just as easy to mow with same result? I do understand that killing the tops now through July will knock many woody plants back. Have you ever thought of a town or concerned landowner (for example, farmer hoping to keep chervil from spreading into a hayfield) hiring you to flame treat roadside garlic mustard &/or wild chervil now before seeds are released? I was on an organic farm in last week and they have sections of ledge in the pastures with multi-flora rose and black swallow-wort co-existing in patches. I wonder about flame to reduce those populations. We are just in the initial stages of treating knotweed with flame, so I don't know how many follow up treatments it will take to knock it out. My guess is it will take at least several follow up flame treatments each time the knotweed reaches 6" to 2' tall. However with each treatment the shoots should become more feeble. This time of year seems to be good for making the initial flame treatment because the grass has greened up in the fields yet the old knotweed stalks on the ground still burn well and help generate more heat to kill the new shoots that aren't too tall. 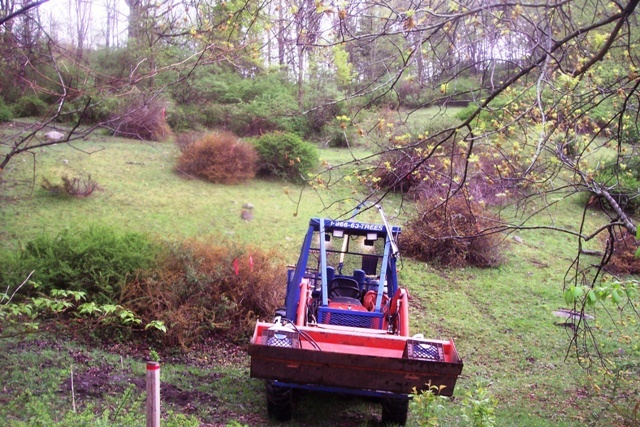 Tight mowing should also work, but often can't reach over banks or be conducted on rough, rocky, or soft ground. Flame can reach everywhere and you can see the leaves wilt immediately when hit with a 2 million BTU/hr flame. We have not tried any flaming with chervil or garlic mustard, but it is well worth a try. Again repeat treatments will probably be necessary. A town or concerned landowner hiring flaming done to treat garlic mustard and chervil before it seeds makes very good sense. Flaming eliminates the risk of mowers moving plant material and can knock back invasive plants tight around trees and rocks (bark protects the trees from the quick passage of the flame) as well as tight to the ground. There is little noise an no objects are shot from a whirling mower. If flaming is done after things have greened up and when conditions are moist (dew on the grass is sufficient), the quick passage of a 2 million BTU/hour flame will rupture and kill the cells of the target plants without igniting any fires.